This focuses on linearity of PowerOut/PowerIn and S Meter response. I often use a receiver for measurements, eg with NFM and FSM, and its linearity of PowerOut/PowerIn is important to understand. Above is a plot of indicated power from FSM (Duffy 2004) against signal generator output. The delayed AGC knee is quite obvious, and below that point (-96dBm) the linearity is quite good, as good as these receivers tend to be. The receiver is quite satisfactory for measurements up to -96dBm in this configuration with no preamps, attenuator off, and 2400Hz soft filter. The AGC threshold is 30dB above the noise floor (-127dBm), a little higher than most receivers. 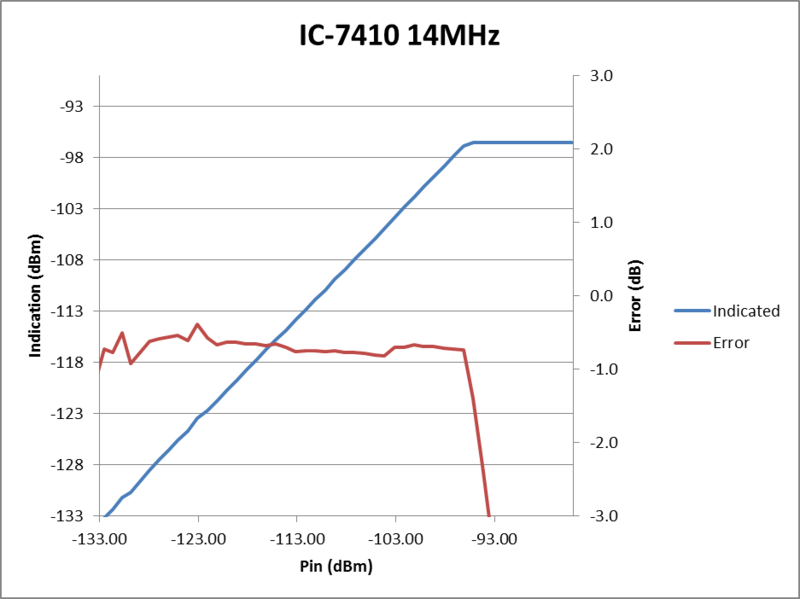 Though the noise floor is -127dBm, the plot shows that measurements down to that level with FSM are quite accurate, error increases below the noise floor. 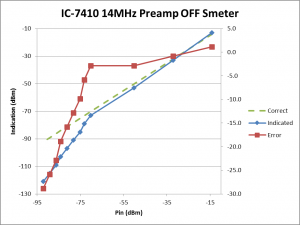 Experience is that FSM can measure with reasonable accuracy down to about 6dB below the noise floor. S Meters are a handy measurement of received signal strength. There is an IARU convention that S Meters are calibrated for 50µV in 50Ω (-73dBm) for S9 and 6dB per S-point. Above is the relationship between S Meter indication (converted here to dBm on the basis of the IARU convention) and signal generator input. Most SSB receivers have large error at the low end, an artifact of the use of delayed AGC to drive the S Meter and in that case, AGC is typically delayed until some 20-25dB above the noise floor, 30dB in this case. 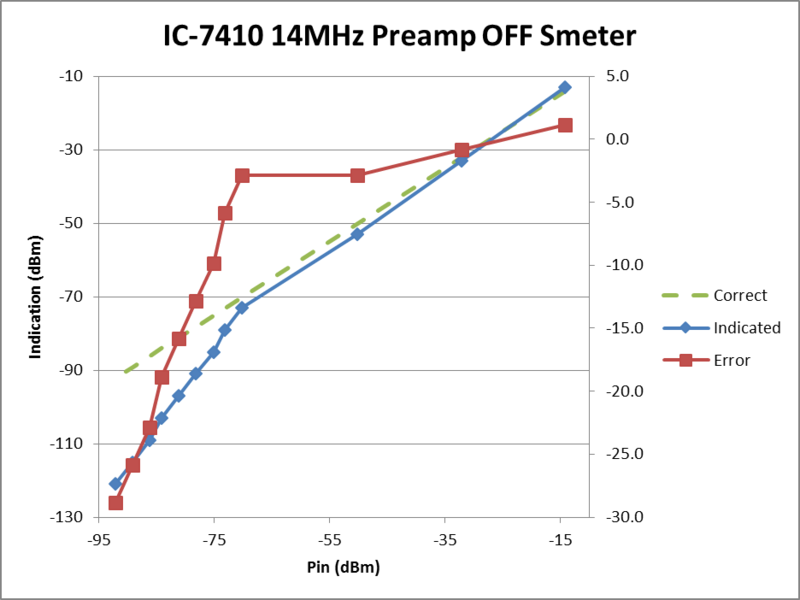 The difference with the IC-7410 is that it doesn’t get on track until -73dBm (S9) which is a good deal higher than other receivers which commonly track reasonably well above about -97 to -85dBm (S5-S7). In fact, the IC-7410 spaces S-points out fairly evenly from S1 to S9 as just 2.4dB per S-point, less than half the IARU convention. (Lindquist 2011) does not mention this behaviour. Duffy, O. 2004. Field Strength Meter (FSM). https://owenduffy.net/software/fsm/index.htm. ———. 2007. Noise Figure Meter (NFM). https://owenduffy.net/software/nfm/index.htm. ———. 2012. 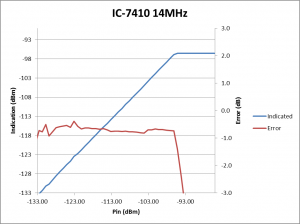 Measuring RF power with an SSB receiver. VK1OD.net (offline). ———. 2012b. S meter calibration and scale shape. VK1OD.net (offline). 6 Meter Transceiver In QST Oct 2011.